Matchday nine (9) of the Ghana Premier League came with not so many surprises, as the various teams battled their way to supremacy. Aside two games – Berekum Chelsea vs Liberty Professionals and Dreams FC vs Aduana Stars – all the other matches were played as scheduled. Here are five major talking points from this week’s round of games. WAFA began life after Klaus Rasmussen with a hard-fought 3-2 win over Ebusua Dwarfs on Sunday. The Academy Boys have endured a miserable run of form in recent weeks which has seen the club drop out of the top four places. Having gone five straight games without a win – recording one draw and four loses – the Sogakope-based side saw their manager opt to jump off the sinking ship. Rasmussen’s resignation on Friday came as a shock to many, especially if you look at his transformation of the side last season. However, despite the shocking nature of his departure, it appears WAFA have finally got their mojo back post the Danish tactician. The win over Dwarfs may not have come with the fluid football that WAFA are known for, but it is the perfect tonic that the club needs at the moment. And the manner in which it was achieved – fighting of a late onslaught from Bechem – shows that the club is ready to move on from the coach who took them to their highest finish since joining the Ghanaian topflight. In just seven days, Hearts of Oak have moved from title contenders to a side languishing on 10th on the Ghana Premier League table. The Phobians were again frustrated on Sunday after being held to a 1-1 draw by Bechem United. Hearts have not had a good start to the season, but this game highlighted everything that has accounted for the club’s slow start. Lack of assuredness in defense, poor goalkeeping and a wasteful bunch of attackers have been the bane of coach Henry Wellington’s side this season. Against Bechem United those problems once again surfaced as the Phobians conceded a cheap early goal following a howler from goalkeeper Theophilus Jackson. But more worrying was the apathetic showing from the club’s attackers. Cosmos Dauda, in particular, was wasteful throughout the game, having spurned a couple of gilt-edged opportunities to win the game after Patrick Razak had equalized for Hearts. The Accra giants do not boast the strongest squad in the division, but if there is anything that has greatly hampered their progress this season, then it is their wastefulness in front of goal and inability to kill games. Unfortunately, that beast roared its head once again when they faced Bechem United on Sunday. 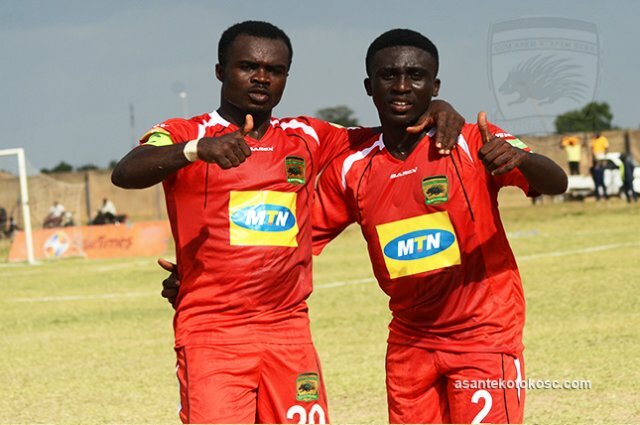 Asante Kotoko finally exorcised the ghosts of their travels by defeating Wa All Stars 2-0 at the Wa Park on Sunday. Prior to the encounter, the Porcupine Warriors had not won a single game on the road, with their previous away game ending in agony at the hands of Dreams FC. However, coach Paa Kwesi Fabin and his charges put up a five-star performance against the Northern Blues thanks to goals from Amos Frimpong and Fredrick Boateng. The win sees Kotoko move back into the top four and, more importantly, back into the title race. With Ashanti Gold now just three points ahead of the Kumasi giants, there is every chance that Kotoko could challenge for a 23rd league trophy. A woeful away form is what has hampered Kotoko this season, but if the club can replicate Sunday’s performance more regularly, then their title ambitions would definitely be handed a huge boost. Earlier this week the media space was dominated by talk of CK Akonnor leaving Ashanti Gold for a more high-profiled job. The former Black Stars captain joined the Miners last season when they were seriously struggling but managed to steer the ship out of the mud and into safety. The 44-year-old has continued right where he left off, guiding Ashanti Gold to the top of the Ghana Premier League table in impressive fashion. On Sunday the Miners once again emphasized their title ambitions with a 1-0 win over Inter Allies at the Len Clay stadium. There is no doubt that CK Akonnor is the man at the moment, and at this pace the Miners will struggle to keep him. Having already spoken about a desire to manage the Black Stars, there is little doubt he also personally has his eyes set of higher heights. “When it is my turn to lead Ghana no one can stop it. If I have to coach the U-17 and U-20 to get there it is all in the hands of God,” the Ashanti Gold manager said earlier this week. Talk of managing the Black Stars may be premature, but CK Akonnor is definitely the man of the moment! It remains unknown what really has accounted for the severe slump in form of Wa All Stars this season. The Northern Blues have endured a poor run of form since the season began, having won just a game. And the club’s woes were compounded following Sunday’s 2-0 home loss at the hands of Asante Kotoko. When Wa All Stars won the league two seasons ago, one of the major factors that steered it their way was a solid home form. However, that sort of uncompromising home form seems to have deserted them as they sit bottom of the table with just five points from nine games. The appointment of Sarfo Castro was meant to help save their season, however, not even the change of technical heads seems to be working. The loss against Kotoko was the Wa-based side’s second in a row at home and fourth in succession in the league. It’s a new manager at the helm, but the club’s problems seem to run deeper than meets the eye and a real resurgence is needed to save their season.